The older we get, the harder we find it is to make and sustain friendships. These friendships require a different kind of care than the friendships we had as children. 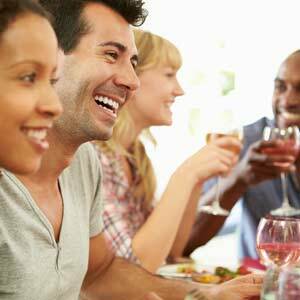 Follow these tips if you're looking to make adult friendships that work and last. Between work and family obligations, sometimes it feels impossible to make time for friendships as well. Just like a marriage, though, friendships need time and attention to keep going strong. You shouldn't let those busy schedules cause a friendship to drift away. You need to pick a standing time to focus on your friendship, and make sure you do everything possible to honor that time. One possibility is meeting for lunch on a particular day each month. After awhile, these lunch dates will become such a habit that you don't even have to plan them anymore. Like many other people, you may have a lot of people you're friendly with, but you wouldn't consider them close friends. It's hard to take that next step from superficial small talk to a deeper level of friendship. If you know someone at work who you enjoy talking to, ask him or her to join you for drinks one evening. If you're not sure what types of people you're compatible with, then an online psychic reading can help you learn what to look for to create future friendships. While social media was supposed to bring us closer to our friends, it sometimes has the opposite effect. Emails and texts may be quick and easy, but they're also impersonal. You should make a point to call your friends from time to time just to talk and see how they're doing. While you're talking on the phone, make sure you don't hang up without setting a specific day and time to get together in person. No single person can offer everything you need out of friendships. Therefore, it's perfectly acceptable to have different friends for different activities. Perhaps you have an athletic friend who you play tennis with every week, and an outgoing friend who's perfect for drinks and dinner. When you know what need your friendship fulfills, you'll get the most out of that friendship. If you're struggling with knowing what type of friendships you need in your life, a tarot reading can help you learn more about yourself and what types of friendships to focus on. Good friendships not only make you feel better, they can help you live longer as well. One Australian study found that those with a large network of friends outlived those with a smaller network by around 22 percent. Additionally, friendships have shown to decrease unhealthy behaviors like heavy drinking and smoking. These are just a few reasons why it's important to use these tips to effectively nurture adult friendships.